The GE Monogram Experience Center brings designers to Louisville, Kentucky, for three-day experiences to learn about Monogram, the design process, our appliances – and even cook with them! We interviewed each designer to learn a little more about their background and design experiences. 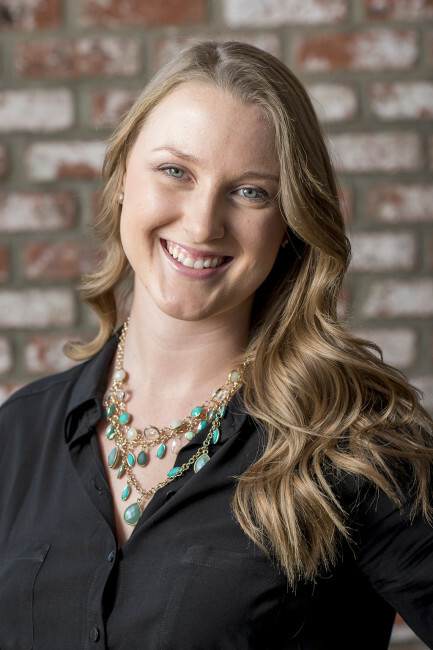 Today’s profile highlights Katie Tomlinson with Kerrie Kelly Design Lab in Sacramento, California. Katie Tomlinson, recent designer participant at the GE Monogram Experience Center in Louisville, Kentucky. SRFD: How did you become interested in design? Katie: Growing up, I moved A LOT and decorating my room was always my treat. From creating a gallery wall of my favorite boy bands at age 11 to painting the signature Burberry plaid on my wall at age 14, I’ve always loved creating inspiring spaces. Not to mention the influence I gained from watching HGTV with my mom. SRFD: Tell us about a recent project you really enjoyed. Katie: A new and fun experience for me has been designing virtually for our client abroad in Switzerland. She and her family are moving back to Sacramento and were looking to, what we call, ‘de-Tuscanize’ her home. Taking yellow-gold walls, creamy trim, ornate bronze chandeliers and brown shag carpeting to a modern and sophisticated space with ‘greige’ walls, contemporary lighting, and high contrast white trim and cabinetry. Now she is back in the States and needs help furnishing the house. Mixing her eclectic artwork from traveling all over the world with her newfound love for contemporary design has been such a fun experience. This is one before and after photoshoot I’m really looking forward to! SRFD: A trend you’re over? Katie: Chevron! It was great for a while but seems to be a bit overdone. SRFD: A trend you’re excited about? Katie: Chevrons’ replacement?? I’m seeing PLAID! Anywhere from its traditional look to its updated version with pops of color such as chartreuse, pink and orange. SRFD: What did you learn in Louisville?